The TLC 19 was commissioned for production building in GRP by Nebe Boats of Cape Town. Her South African builder is now Wayne Robertson Yachts, of Cape Town. She is also available from F & A Yachting in Istanbul, Turkey. They have modified her hatch detailing to bring her in line with the EU regulations. She is offered in two formats, either with swing keel and pivoting rudder blade or with fixed keel and fixed rudder. The swing keel version is fully trailable, with a keel-up draft of 0,65m, allowing her to also be brought close in to protected beaches. The swing keel is totally outside the hull so that it does not compromise the interior. Two fixed keels have been drawn, a wing keel of 1,1m draft and a bulbed fin keel of 1,45m draft. 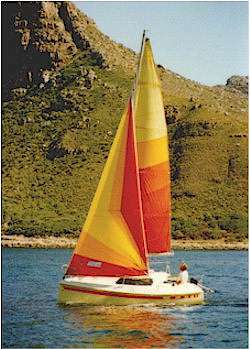 The rig is fractional sloop with fully battened main, swept spreaders and single lower shrouds. Combined with an adjustable backstay bridle, this gives an easily handled rig with enough options for the performance sailor. The mast is deck stepped with a hinged foot to ease raising and lowering. The mast compression loads are taken up below decks by a post which also supports the adjustable table. The cockpit is large and comfortable, with 1,75m seats long enough to sleep most of the family. Hubby may have to let his feet hang over the transom if he wants to sleep in the open. There is a large lazarette locker in the port quarter for sails, outboard motor etc. The aft end of the cockpit well is open through the transom for quick draining and to give access to the swim platform. The hull form is very much like a mini BOC racer with shallow underbody, almost plumb bow and broad, flat stern sections. It is very efficient both upwind and down. There are planing boards to extend the sailing waterline aft, with the transom hung rudder mounted in a V-shape cut-out. The moulded-in boarding platforms do away with the need for a swim ladder and are a magic place to sit when sailing in protected waters. Below decks she has comfortable sitting headroom with plenty of hip room over all berths. The companion hatch is in two sections, of which the aft section can be slid forward by itself or the two can slide together. This allows the interior to be opened up in good weather, also giving standing head room to the galley. She has four adult size single berths which double as settees and the forward berths convert to a double. Due to the plumb bow there is plenty of beam in the forward sections of the hull to give more foot room to the double berth than will be found in many much larger boats. All berths are 1,95m (6'4") long. The galley has room for a two burner stove and with a storage bin behind. The table can seat four adults comfortably but they will have to be very good friends to spend more than a day or two together in a yacht of this size. She is better suited to a couple with one or two small children. There is space below the galley for a small chemical toilet or, in the fixed keel version, it can be stowed under the forward end of the cockpit. There is also the alternative of an enclosed heads for those who want such a feature, with the loss of a quarter berth. The TLC 19 is a compact but comfortable getaway home for a couple or small family, with performance to keep even the racing man happy. Although designed for construction from female moulds, she could also be built by a skilled amateur in sandwich GRP. For a larger yacht in a similar concept, see the TLC 27. 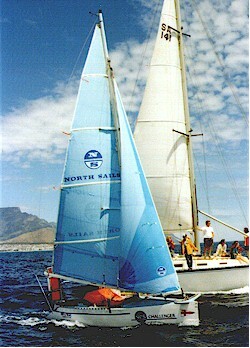 A custom open version of the TLC 19 was used by Anthony Steward in accompishing the first ever open boat circumnavigation of the world, in 1991/92. To date he remains the only person to have completed such a voyage. He endured tremendous hardship during the voyage, including being shiprecked on a deserted island in the Indian Ocean. Do not expect to do the same voyage in a stock TLC 19 but consider his achievement an indication of the seaworthiness of this little boat. Click here to view the stability curve or list of drawings for this design.